drawing for a free initial consultation session with Ms. Katz. Bristol SEPTO is a support resource for parents and families in the greater Bristol area. - Come and learn about how to be an effective advocate for your child, best practices, and available services. 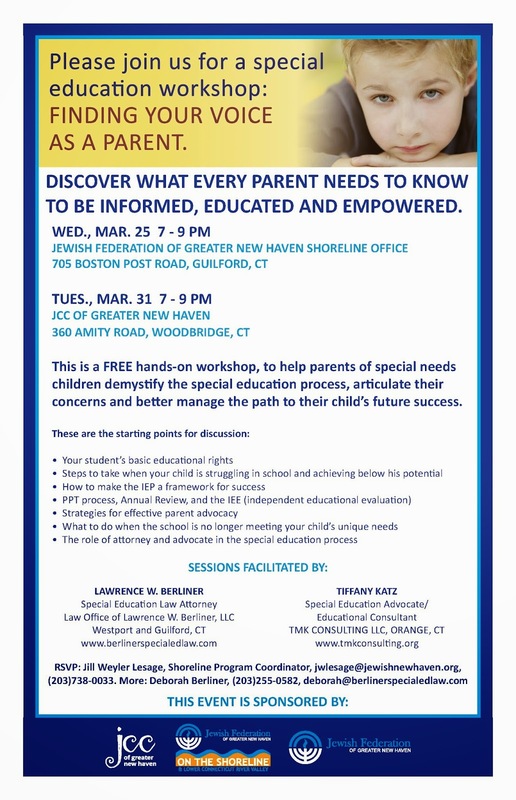 - Gain insight into your child’s educational rights with an expert from the field of special education advocacy. We are excited to have Tiffany Katz coming to our January meeting. She is a special education teacher who has worked in resource rooms and self-contained classrooms. THERE WILL BE A GIVEAWAY FOR 2 FREE CONSULTATIONS with Ms. Katz!! The monthly meeting of SEPTO Network located at the Margaret Egan Center. For directions, please see our "Meetings" page. WOODBRIDGE, CT –Celebrate Rosh Hashana in the sweetest way….at a specially designed service for families with special needs on Sunday, September 23 from 1 p.m. – 2 p.m. at Congregation B’nai Jacob, 75 Rimmon Road, Woodbridge , CT.
All families are welcome for a warm, inviting, musical and interactive experience! The service is designed to be accessible and sensitive to a variety of needs. We look forward to sharing prayer, Torah, music, and sweetness as we welcome in the New Year together. This service is open to the entire community (members and non-members) and all ages are welcome. The special service is jointly sponsored by TMK Consulting LLC, Congregation B'nai Jacob and the Center for Jewish Life & Learning.